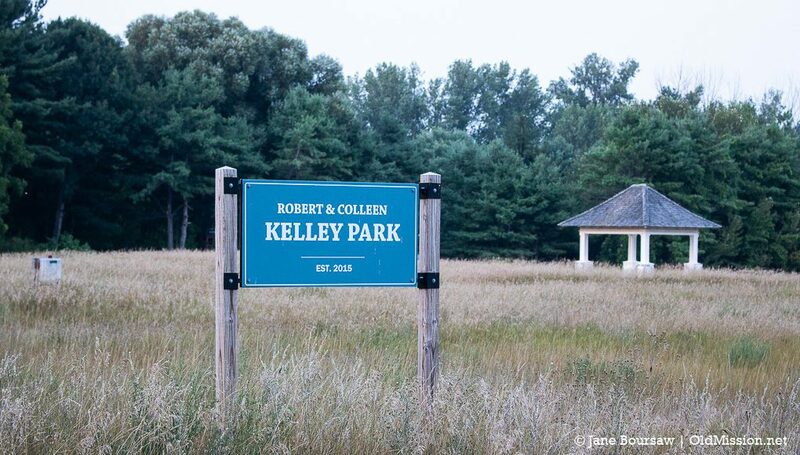 The Michigan Department of Natural Resources (DNR) has scheduled a community meeting for Thursday, August 23, 2018, 4 – 6:30 p.m. at the Peninsula Township Hall to discuss plans for Kelley Park. Old Mission Peninsula residents are invited to attend the meeting and learn more about the DNR’s plans for the park, also known as the “Old Moorings” or “Nevinger Campground,” located across the road from the Old Mission Inn on Mission Road. At an informational meeting on August 2, 2017, DNR District Supervisor Tim Schreiner outlined plans for the park, noting that the DNR purchased it a number of years ago with funds from the Michigan Natural Resources Trust Fund. Because of the cost of dredging and maintenance, Schreiner said the DNR has concluded that Kelley Park is best suited for carry-down boats – kayaks, canoes, paddleboards, etc. – which do not require a dredged channel. The DNR will also utilize some of the current asphalt and pavement for parking, and a vault toilet might be included in the design, as well. Also, because of wetland grasses in the beach area, which are protected by the Department of Environmental Quality, using it as a public beach would be complicated, said Schreiner. For questions about the meeting or plans for Kelley Park, contact Annamarie Bauer, DNR Regional Field Planner, Northwest Lower Peninsula, at (231) 775-9727, extension 6012. Interesting statement that public use would now be “complicated” after how many years it was used by the public. What about when it was a fishing village, and years later the inn and then the campground. The beach and swimming area there was some of the nicest around and the campground was always full with people enjoying the area. Wasn’t it going to be developed with houses and was it “complicated” then for use? Maybe. Thank you to the Kelley’s, Peninsula Township and the DNR for preserving the land. Thanks for the note, MJ. Yeah, I guess we’ll find out at Thursday’s meeting what’s up with Kelley Park. I’m guessing if they plan on including a vault toilet, that’ll make it more accessible for people, kids, etc. Sure would be nice to transfer some of the traffic from Haserot over to this spacious parkland (though I know some of the Old Mission locals like the quiet of Kelley rather than the hoards at Haserot, so I’m ducking and running for cover over that statement).